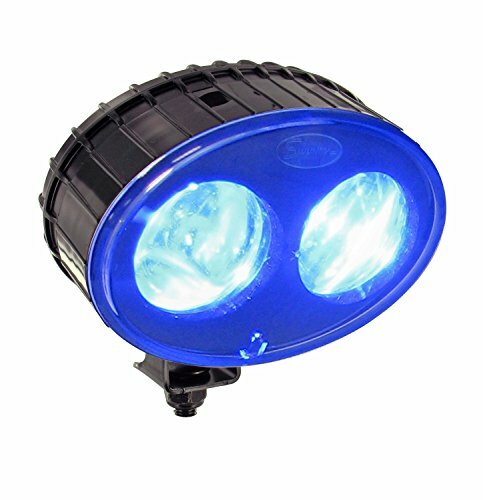 The JW Speaker 770BLU oval safety spot light has two blue LEDs, a lens and housing made of polycarbonate to resist rust, corrosion, and ultra-violet (UV) light, and a universal mount, and is suitable for use on forklifts. The LEDs and lens project a focused beam of light on the ground to visually warn pedestrians that the equipment is moving in that direction. Each LED has 20,000 hours of life to help minimize maintenance. This safety light is a multi-voltage light that operates on 12-48V DC input and 9W power. It comes with a universal mount and requires one M10, 1.5 x 20 mm bolt (sold separately) for installation. An AMP 180923 connector with a 12" wire is included with the light for installation. Tools for installation are sold separately. This safety light is sealed to the Ingress Protection IP67 standard for protection from dust and protection when immersed in water up to 1 m deep for up to 30 minutes. It has been manufactured to comply with United Nations Economic Commission for Europe (ECE) Regulation 10 for electromagnetic compatibility, and Society of Automotive Engineers (SAE) standard J1455 for temperature, moisture, salt spray, and shockproofing. This oval safety light measures 3 x 5 inches (H x W). (H is height, the vertical distance from lowest to highest point; W is width, the horizontal distance from left to right.) It's recommended that this one light should be mounted on the front and one light on the back of the forklift. JW Speaker manufactures vehicular lighting products for use in material handling, transportation, and public safety, among other industries. The company, founded in 1935, is headquartered in Germantown, WI. If you have any questions about this product by Intella Liftparts Inc., contact us by completing and submitting the form below. If you are looking for a specif part number, please include it with your message.